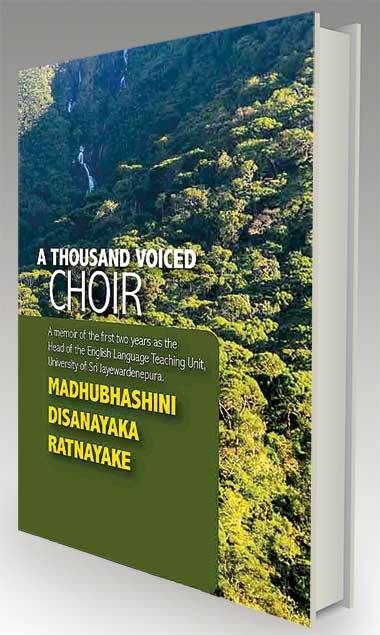 A Thousand Voiced Choir by Madhubhashini Disanayaka-Ratnayake is an unusual book. 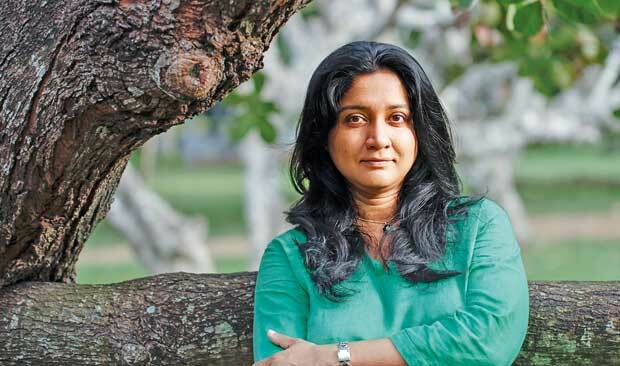 It traces her experiences as head of the English Language Teaching Unit (ELTU) of the Sri Jayewardenepura University during the first two years.It is unusual because we have a very large number of English teachers in this country, of all levels, and nobody as far as I can recall, has ever written a detailed account their teaching experiences. A Thousand Voiced Choir is the story of a satisfying walk through a minefield, satisfying because the author’s account of those two years is by all means positive. English teaching is a minefield. Despite there being so many schools, and tuition gurus, who claim to have brought English fluency to tens of thousands, while laughing all the way to the bank, the desperation to learn English by masses of students is more evident than ever, and it is hard to find a fluent speaker or writer in English. In that context, Madhubhashini’s account of how this life-or-death task was tackled at university level is of untold historical value. She has one thousand undergraduates with very basic English, or not even that, and five teachers, not enough classrooms and facilities. But she takes on this mammoth task, with a ‘can-do’ spirit which is reflected boldly in the book’s 144 pages. The book is lavishly illustrated with black-and-white photographs. The last page carries one of a protest poster at the university. It says: “Affirm the rights of students to study in the English medium,” testimony to the success gained by the ELTU. "A Thousand Voiced Choir is the story of a satisfying walk through a minefield, satisfying because the author’s account of those two years is by all means positive. " Starting from scratch, the ELTU acquires a pleasant ‘English learning zone’ in the main library, enough classrooms and teachers so that groups of 6 or 7 members can study on a rotational basis. The author deals with bureaucratic Catch-22 situations and reduces red tape to a minimum. She believes in keeping things short and simple. While some can take English studies for granted, for those from rural schools with mediocre English teachers or no teachers at all, studying the language at university level can be a daunting prospect. The author writes about one female student who habitually frowned when attempting to speak in English out of fear. But the ELTU throws in two drama teachers, as well as meditation and Dhamma discussions in English, film shows and books, in a bid to break down inhibitions, quell fears, calm nerves and to create an environment and mindset conducive to studying a difficult subject. “The irony of being appointed as Head of the English Language Unit of the Sri Jayewardenepura University was not lost on me when I received my letter of appointment in 2011. This is the university that prided itself on being the first university to offer degree courses in Sinhala, (The pioneers of university education – the University College of Colombo – had chosen English as the medium of instruction). "To succeed nowadays, more often than not, one doesn’t need English. Once you make it, all you have to do is to hire those who have spent years studying it for a pittance." “The creation of this university was a reaction against the elitism inherent in English education.” All in all, this is an eye-opening work. But I have a few criticisms. Take, for example, the following passage. I have several criticisms of the above passage. I apologise in advance for taking myself as an example. This isn’t due to vanity but simply because literary criticism at one level is as subjective as creative writing is. I hardly know any Sri Lankan who knows how to speak English like a native speaker, if by that the author means a British citizen (unless it is someone of British origin, like the late Dr. Arthur C. Clarke, who became a Sri Lankan citizen, and assuming it is British English rather than American English that we are talking about. Actually, the younger generations speak a hybrid of British, American and Sri Lankan English). I consider myself to be relatively fluent in English. But I don’t speak English like a native speaker. I have met Sri Lankans who are even more fluent in English than myself. But none of them speaks it like native speakers unless they have lived and studied in the UK from their childhood. The grammar and syntax of a Lankan, fluent in English will match that of an educated British speaker. But the idioms are different. There are differences in vocabulary, too, though this will depend very much on the education of the speaker and subject matter involved. Secondly, while I don’t dispute the author’s statement that such a speaker will come from a background of relative affluence (with real emphasis on ‘relative’) I will dispute any suggestion that this automatically gives anyone the ability to meet the world with confidence and style. Apart from the language spoken, there are allied factors such as personality, family background, inner-drive and, unfortunately in Sri Lanka, political and connections. Those matter everywhere but over here, it is still a case of whom you know more than what you know. Of course, this will depend on the job. Connections won’t get anyone a job with a foreign embassy as a translator. "As for any advantages in the job market, that would depend on the job context. That might be true in sectors like sales of up-market products, and banking, though in banking that hardly seems to be the case when it comes to state banks. It is no longer true of politics and business"
But there are people who can’t write a decent letter in English, and speaking it badly, holding top Government jobs including the Diplomatic Service, and drawing astounding salaries and other perks, while people with fluent English labour under them for ridiculously low pay. If anyone is interested, I can personally cite examples, though not in print. Nor has my English skills given me any notable advantage in the job market. When it comes to English–medium journalism, at any rate, many journalists are less than fluent in English, but they manage. This is true of almost all other job sectors. People manage, that’s all. Ever since I began working for newspapers in the 1980s, I have witnessed a massive shift to a Sinhala-oriented culture among what has till then been an English-speaking milieu. Nowadays, you’ll find a majority of cases with people working in English, but using Sinhala as a personal medium of communication. As for the class markers, my personal experience are that English proficiency has never has never been able to shift them in any significant degree. While I can enjoy the delusion that a chat in English makes me socially acceptable to the upper crust ‘native speakers’ of the language, a post-conversational reality check should confirm the depth of this illusion. You always remain Persona Non-Grata. My personal observation is that the death is the greatest leveller, though when you go to a cemetery and look at the tombstones; even this doesn’t seem to be true. Money comes to a close second, and language proficiency a very distant third. Of course, our urban job market has an insidious school and club-oriented network which parallels the obnoxious caste template, and I would not deny that class may ease some things in the job market, and the related marriage market. But the above-mentioned levellers will always remain true within their allotted slots. People check out more than an outsider’s English proficiency before opening doors. I need to question too, the following statement: “…that was why it was so difficult for someone who had learnt English as a Second Language as an adult to compete with someone who was always fluent in English, in the job market.’ But we have all of us learned English as a second language. The author is making a clear difference between those who learned English as adults and those who learned it as children. While the latter would have a better start, belonging to the latter category doesn’t mean automatic fluency in English. In my case, I always earned good marks for English studies (while studying in Sinhala medium government schools) but fluency in the speech came as an adult (starting at the Advanced Level class when I started trying my English with a friend who was fluent). Only my first school, Sri Sumanagala Vidyalaya at Panadura, could be said that offered a good standard of English. Isipathana and Ananda in Colombo, my subsequent schools, had poor English standards when I got to them. That would still put me ahead of anyone arriving in Colombo at 18 plus from a Madya Maha Vidyalaya from nowhere. But many such people have moved ahead in life, and that’s not due to their English. As for the local Arts student, who is at a disadvantage in a globalised setting, which follows the Western model, the trouble is not just with English, but with other essential communications tools such as computer skills, plus the degree of sophistication needed to create the right image of oneself for that market. I feel that our education system fails to give that degree of sophistication to the average student, and that isn’t just due to lack of English, for there is nothing to say that sophistication is based on English knowledge alone. As for any advantages in the job market, that would depend on the job context. That might be true in sectors like sales of up-market products, and banking, though in banking that hardly seems to be the case when it comes to state banks. It is no longer true of politics and business. We have an English-speaking elite and a Sinhala-speaking elite in both sectors. "But there are people who can’t write a decent letter in English, and speaking it badly, holding top Government jobs including the Diplomatic Service, and drawing astounding salaries and other perks"
The English-speaking elite still have a foothold at national level politics and corporate business, though if we take the six presidents in our history, only two can claim to be fluent users of English. At the provincial level, it is overwhelmingly Sinhala dominated. Both elites are doing equally well, one might add. Then again, we have an English-speaking class which is not an elite by any stretch of the imagination. Most of them use some English at work and at home. They are in the corporate sector, banks (mostly private), advertising (again, not everybody), teaching and the media. The latter is Sinhala dominated, but let’s consider this for a moment. The number of English speakers in Sri Lanka is estimated between 5 and 10 percent of the population; yet, the country has seven national newspapers in English. Even if we accept that the circulation is based on advertising rather than news and features, we can only conclude that the impact of English in the country is far out of proportion to the actual number of speakers. One can argue endlessly about all this, but the position of English in our society is continually shifting in relation to local politics as well as its international position in politics and business. English may be a proverbial sword, but the wielder is only effective as the socio-cultural armour that he is allowed to carry by inheritance, heritage and culture. If one makes a survey of the 100 richest people in the country, a surprising number may not be fluent in English or not have any English at all. The same would be true of knowledge, the other wealth. Can anyone argue that the English literature or journalism we produce is superior to its Sinhala counterpart? In this divided society, political connections matter as much as class, if not more, and money matters more than anything else, including race and caste prejudices. To succeed nowadays, more often than not, one doesn’t need English. Once you make it, all you have to do is to hire those who have spent years studying it for a pittance.